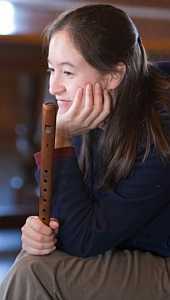 Miyo Aoki is a Renton WA based recorder teacher, performer and early music scholar. She has degrees in early music performance and mathematics from Indiana University and KAZ Diplom (Artist Diploma) from the University of the Arts in Bremen, Germany. She has performed in the US, Germany, and Poland, and has premiered works by contemporary composers. She teaches privately and has collaborated in outreach programs for children.